call it beauty. 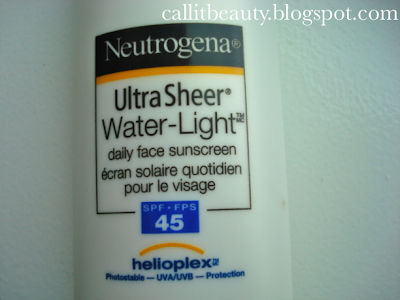 : Sun Care With Neutrogena! I have a confession to make: Up until approximately 5 years ago, I pretty much never wore sunscreen. I was, by no means, a sun worshipper. But I used to be quite active and used to stay outdoors a lot. As I think about it now, I'm so thankful that I'm not suffering from any sort of skin disease. As I'm getting older, skincare has become more important to me. I'm glad to say I'm not yet dealing with wrinkles or any other pre-mature aging symptoms (I almost typed "skyntoms." Aren't I clever :p), but prevention is definitely something that is occasionally on my mind. I was religiously using Clinique's City Block for some time but I kind of fell off the bandwagon a year or two ago. 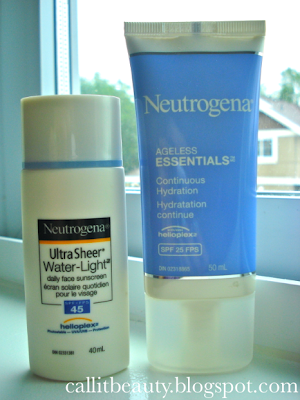 Now, I'm trying to get back into being consistent with my sun care and these Neutrogena products are certainly helping me in that area. I've been using the Josie Maran Argan Oil as a moisturizer for a few months now and while I still love it, it doesn't give me the sun protection I need for the day time. 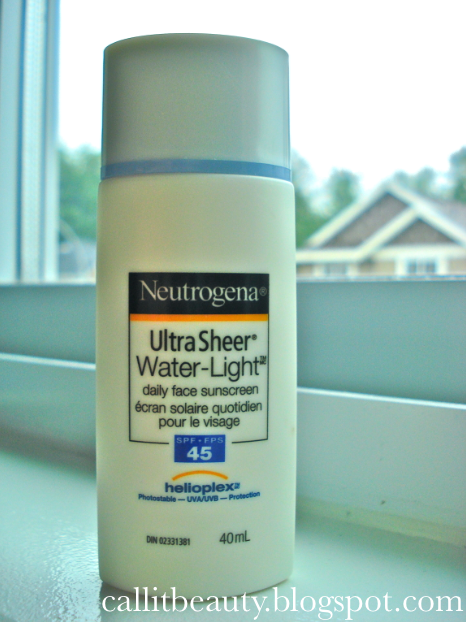 Since I've been really trying to stretch my funds nowadays, I wanted to get a drugstore product. 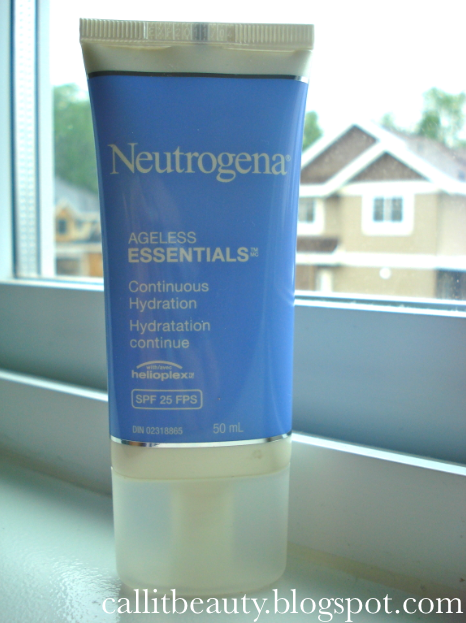 This moisturizer costs $17.99 CAD for a 50mL tube so, bonus points for being fairly inexpensive. It contains Neutrogena's patented "Helioplex" technology; which, according to their website, "helps stabilize sunscreen filters for broad-spectrum UVA/UVB protection from the sun's harmful rays." It also contains Glycerin, which "helps skin build and hold on to moisture longer by treating dry skin deep within skin's surface." 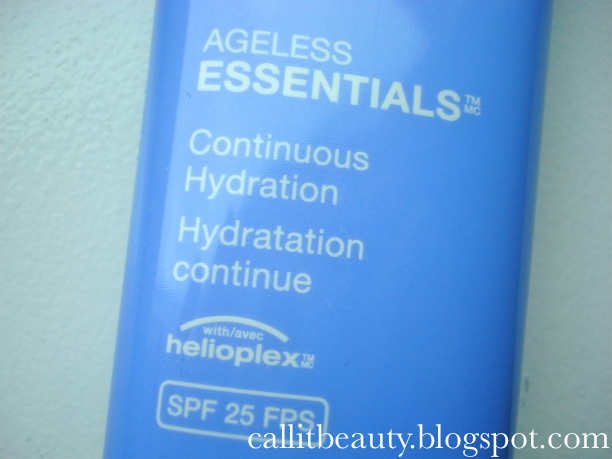 This Ageless Essentials moisturizer does exactly what I want it to: give me sun protection while keeping my semi dry skin hydrated. A little bit of this product goes a long way and I find a small dollop to be enough for my face (extra dollops are for the neck, of course). It also gets bonus points for not making my skin break out! 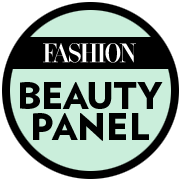 I love how this product sinks into my skin. I typically don't like moisturizers that sink in too quickly because my skin feels dry right away and I end up piling more on. Not so with the Ageless Essentials moisturizer! It sinks in just enough to make my skin non-greasy but still feel hydrated. 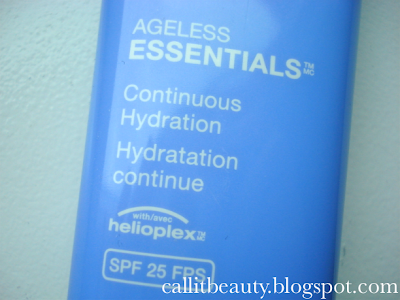 I've reviewed this product before, but I thought I'd revisit it for this post. Like the Ageless Essentials moisturizer, this the UltraSheer Water-Light sunscreen contains Helioplex for a "combined UVA/UVB protection." It is also waterproof, sweatproof, non-comedogenic, oil-free, and PABA-free. This is a fantastic product! I love how lightweight it feels on the skin and like the Ageless Essentials moisturizer, it sinks in so wonderfully and leaves a natural finish. Neutrogena states that it works well under makeup and I have to agree with this. At times when I have applied makeup on top of this product, I found my makeup to apply more evenly and gave a great finish without making my skin look too dewy like the Clinique City Block sunscreen did. Sun protection is so important and yet so easy to take for granted. I wanted to share this video with any of you who have yet to see it in hopes that it will open your eyes to the realities of sun damage. I hope you lovelies will join me in taking better care of our skin. Whip out those self tanners and sunscreens! Our future selves will thank us later :). What's your favourite sun care product?